Beyond the Hype: Top Innovation from a Trusted Brand! Bowflex Treadclimber TC200 – Read our full review. With any type of fitness equipment there is going to be some hype. However, none see to be as hyped than the BowFlex machines. Their commercials run continually and suggest extraordinary results. They show ‘before and after’ photos of select customers, which makes you believe you are going to see miraculous changes. So if you are considering buying a BowFlex TreadClimber or MAX Trainer, it’s important to separate the hype from the actual benefits. There are definite benefits to working out on a BowFlex machines. This is why there are so many positive reviews from customers! Plus, Bowflex recently added a new elliptical line up with some interesting technology features that you may really enjoy! Read on to learn more! Mid Week Sale Ends Thursday: Use the Promo Code on the Bowflex Website to SaveBe sure to check out the ProForm HIIT Trainers before you purchase a Bowflex machine. They compare very well! 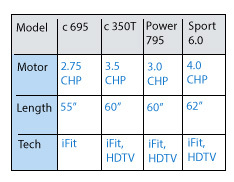 Check out a comparison here. The Bowflex Treadclimbers are similar to a treadmill in that you have a running belt to walk on. Instead of just one moving treadbelt, these machines have two separate pedals that move up and down to meet you feet as you walk. BowFlex claims that the TreadClimber combines the motions of a treadmill, elliptical trainer and stairclimber. This means you will enjoy the belt motion of a treadmill, the incline of a stair-climber, and the reduced impact of an elliptical. The machines have a reduced footprint, thus saving space! An intense cardio workout with less impact on your joints. Burn up 3.5 times the calories of treadmill at the same speed. Burn up to 40% more calories than a stair climber at the same speed. Are the Bowflex Treadclimber Claims True? There is a lot of truth to this claim for several reasons. First, you are walking rather than running and obviously there is less impact and stress when you walk. Second, that treadles rise up to meet you feet which further reduces impact. Finally, you tend to exercise at an incline, which does intensify your workout. Treadclimber TC200 Console – Read our full review here. First off few people purchase stair climbers these days, so I do not even know why they compare the two. Regarding the claim that the BowFlex TreadClimber burns 3.5 times more calories than a treadmill. They base that claim with the treadmill at 3.0 mph and “0” incline. If you crank up the speed and the incline you will also burn some serious calories on a treadmill. It really comes down to how much you are willing to exert yourself on either a TreadClimber or a Treadmill. The BowFlex TreadClimbers definitely have a smaller length than a treadmill and most elliptical trainers. 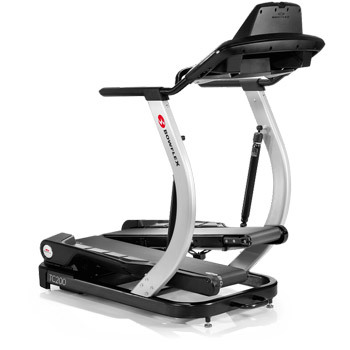 For example, the BowFlex TC100 has a 50.6” length, while the popular Sole E35 treadmill is 71’. So if space is an issue the Bowflex TreadClimber is appealing. There is a photo on the BowFlex website that shows a person on a TreadClimber and there are arrows pointing to the glutes, legs, calves, abs, triceps and back. This photo suggests that the TreadClimber works these various muscles groups, although they do not state that. The Bowflex TreadClimber obviously works the lower muscles like your legs, calves and glutes. However, it has minimum impact on your upper body. You may get some workout to your abs, since you tend to tighten them as you walk up an incline, but the toning is minimal. Like a treadmill, the BowFlex Treadclimber is primarily designed to work the lower body and to give you an efficient cardio workout. It’s equally important that you include your TreadClimber workout with strength training in order to build upper body muscles. Bowflex Max Trainer M8 – Read our full review here. 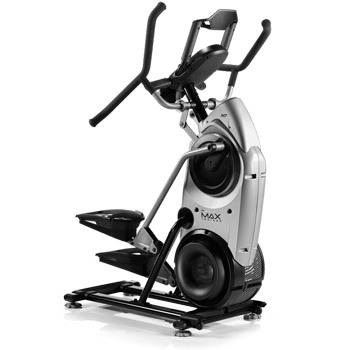 The MAX Trainers combine the motion of a stair climber with an elliptical trainer. There are no moving belts on this machine so it will remind you a lot more of a typical elliptical. The upright design lets you combine the benefits of its two root machines with High Intensity Interval Trainer (HIIT). Combination elliptical trainer and stairclimber. Interval training – Transition easily from high to low intensity to maximize your workout. Easy to mount/dismount – This machine is easier to step onto than a traditional rear-drive elliptical. 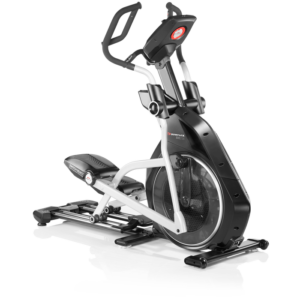 Compact design – The MAX Trainers have a length of around 46″ so it will save you space over the longer traditional elliptical designs. Easy to assemble – Customers report that it doesn’t take an advanced degree to assemble this machine. 3 model options – The MAX Trainers come in model options so you can get the right features for your goals and budget. One of the main competition options for the MAX Trainer machines is the HIIT Trainer series from ProForm. Check out this article for an in-depth comparison of the two brands. The new elliptical trainers from Bowflex offer solid options that will help you make the most of your daily elliptical workout. The console features a Burn-Rate Console (in full color) that lets you see the progress you are making towards your daily goals. Bluetooth 4.0 Compatible – The Bowflex Ellipticals are both Bluetooth compatible so they will sync with the FREE Bowflex Results Series App. Switch-Select Cushioning – Change the pedal angle for additional comfort and muscle activation. Pre-programmed workouts – This is a solid set of workouts programs to keep you motivated and interested in your exercise session. Heavy Flywheels – The flywheels on the Bowflex Ellipticals are some of the heaviest in the industry. A heavier flywheel contributes to a smooth elliptical motion. 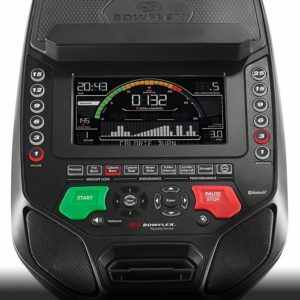 Color LCD Displays – Bowflex uses a “Burn-Rate” console to show you your exercise exertion. The color display is attractive and easy to read. Front Drive System – Front drive ellipticals can be easier to mount and dismount than rear drive machines. They also tend to take up a bit less space. 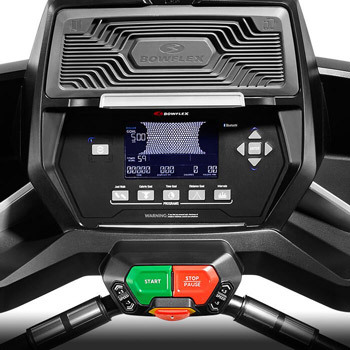 Bowflex BXE116 Console – Read our full review here. Bowflex certainly offers some innovative features on their Treadclimber and MAX Trainer machines. With these machines, you will enjoy the lower impact workout, intense cardio capability, and the ability to tone your lower body. The BowFlex TreadClimbers and MAX Trainers are popular for two reasons: because of all the hype, and because they get results. If used regularly with sufficient exertion, you will burn calories and tone your lower body muscles. Overall, the feedback from customers is various positive, and that alone is a good endorsement. Now, Bowflex also offers Elliptical trainers with Bluetooth compatibility, Switch Select cushioning and heavy flywheels. We appreciate the effort that Bowflex is putting in to provide more options to their loyal customers! To learn more, shop directly on Bowflex.com.